This non-invasive procedure uses tiny crystals to exfoliate and remove the superficial layer of dry, dead skin cells. 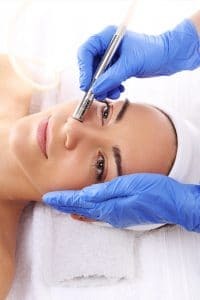 If you have fine lines, uneven pigmentation or clogged pores, you will benefit from microdermabrasion treatments. The dermatologist uses a handheld device that gently removes the top layer of skin. Most patients need a series of treatments to see results. To treat signs of aging, a dermatologist may treat a patient weekly, every two weeks or monthly. After a series of treatments, patients usually say that they have smoother skin and a more-radiant complexion. It takes about 30 to 40 minutes to treat the entire face and about 20 minutes to treat the neck. You may feel a sanding sensation, but it is not painful. You will not have downtime or a recovery period. Some patients’ skin turns pink or red. The skin can also swell a bit. The side effects are similar to having a sunburn or windburn lasting 1-2 days. Microdermabrasion only treats the top layer of the skin, so the skin recovers quickly. Most people can safely have another treatment a week later.